The full-service marketing firm, which specializes in delivering brand experiences and creative marketing solutions across various media platforms, received 14 awards from the Shore Builders Association of Central New Jersey. “We are all very proud of this recognition and we are extremely grateful for the opportunity to produce creative marketing solutions for our clients,” said Tom Villane, President of Design 446. Design 446, a full-service marketing firm based in Manasquan, NJ, was honored at the 13th Annual FAME Awards held at South Gate Manor in Freehold on February 25th. The firm garnered 14 awards from the Shore Builders Association of Central New Jersey across an array of categories, including Best Associate Color Ad, Best Associate Corporate Facebook Page and Best Associate Email Promotion. Design 446 was also on the winning team of Pr1ma Corporation, K. Hovnanian Homes, Del Webb, Trident Environmental and Insite Engineering for a variety of awards including Best Logo Design, Best Brochure, Best Sales Office, Best Associate Website and multiple Community of the Year Grand Awards. “We are all very proud of this recognition and we are extremely grateful for the opportunity to produce creative marketing solutions for our clients,” said Tom Villane, President of Design 446. Through the years, Design 446 has specialized in marketing for some of the largest names in the home building industry. Its extensive business practices collectively offer the unique ability to produce a complete marketing program from sales office design through advertising, logo development, signage, direct mail, print collateral and e-marketing solutions. Each business practice brings an unrivaled depth of experience and level of expertise to meet each client's individual needs. “We create experiences, build brands and inspire actions,” said Villane. The firm celebrated its 40th anniversary last year, and is looking forward to offering state-of-the-art marketing solutions for many more years to come. “Being flexible and innovative while continually delivering the highest quality of services without compromise has been the key to our success,” said Villane. Design 446’s work has been featured in several design books and magazines through the years, and has also been nominated for a number of awards at the upcoming 2016 Sales and Marketing Awards Gala, presented by the New Jersey Builder’s Association. This event, which will be held on March 31st in Atlantic City, acknowledges excellence in the new home sales and marketing industry. The Design 446 team at the 13th Annual FAME Awards. 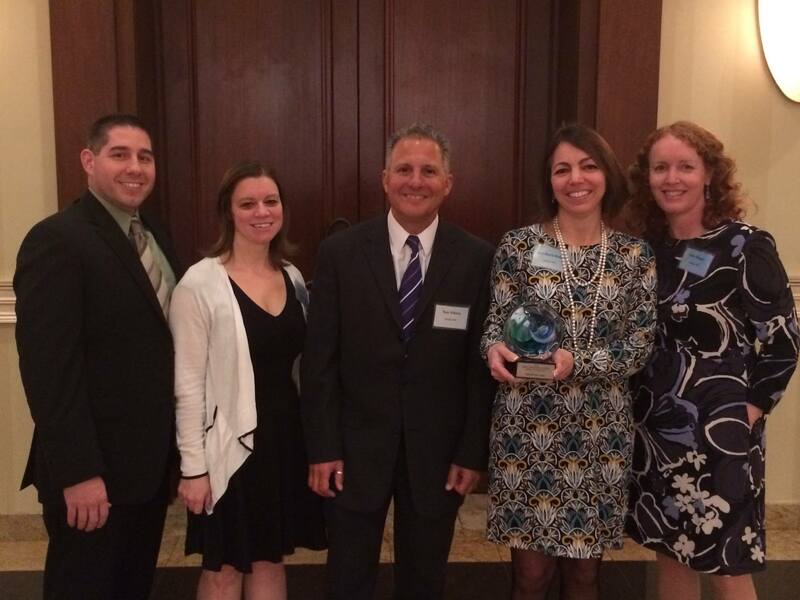 Pictured from left: Nick Nagle, Jayne Galgon, Tom Villane, Ann Marie Baker and Kelly Ragan.